Guatape is no doubt the most popular destination outside of Medellin. In the Eastern Highlands of Antioquia, It’s close to Medellin, which makes it a usual day trip for visitors. However, once you arrive, you will quickly realize there is far too much to do and see in this colorful town and adventure playground. We return for a visit time and time again and discover something new. Every town in Colombia seems to have a theme and a reputation for something. Like the towns of Jardin, Jerico, and Barichara. Guatape Colombia (or Guatapé) has the mysterious rock of Guatape and It's Zocalos, which take on a theme of their own. 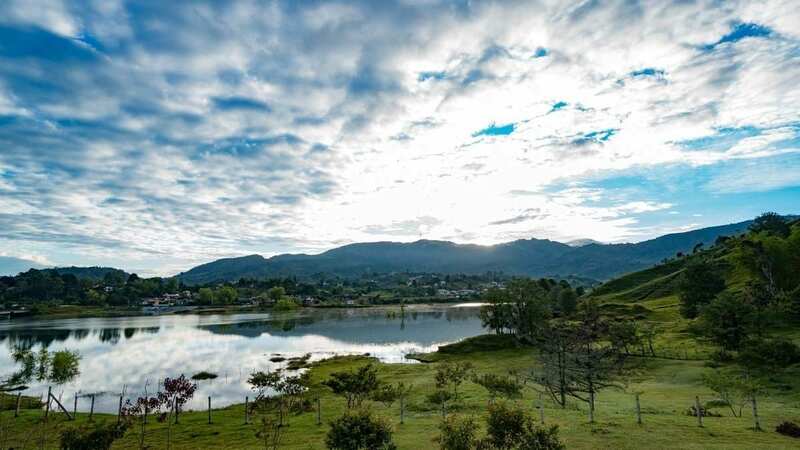 Read on, and we'll explain why these two things and several others are why you should consider spending some time for a few days in Guatape. However a Guatape day trip will definitely give you a good reason to come back for more. 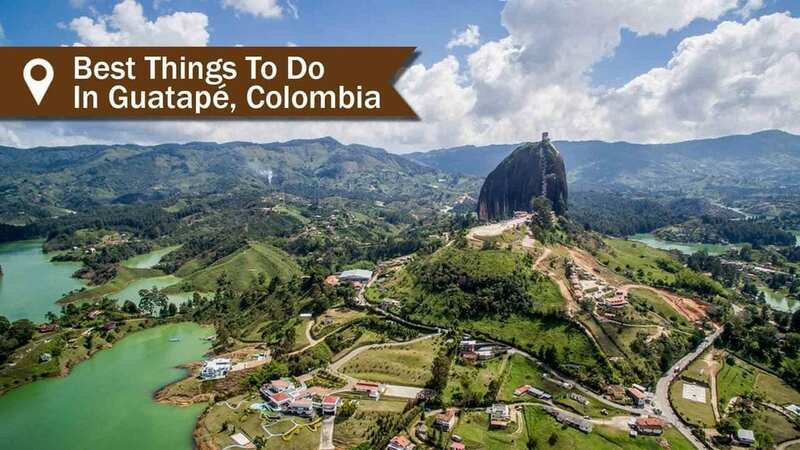 Here are our top things to do in Guatape Colombia and we’d like you to discover them too. 1. Discover the Zocalos by wandering the colorful streets. 2. The Star Attraction - La Piedra or "The Rock"
and we’d like you to discover them too. 1. 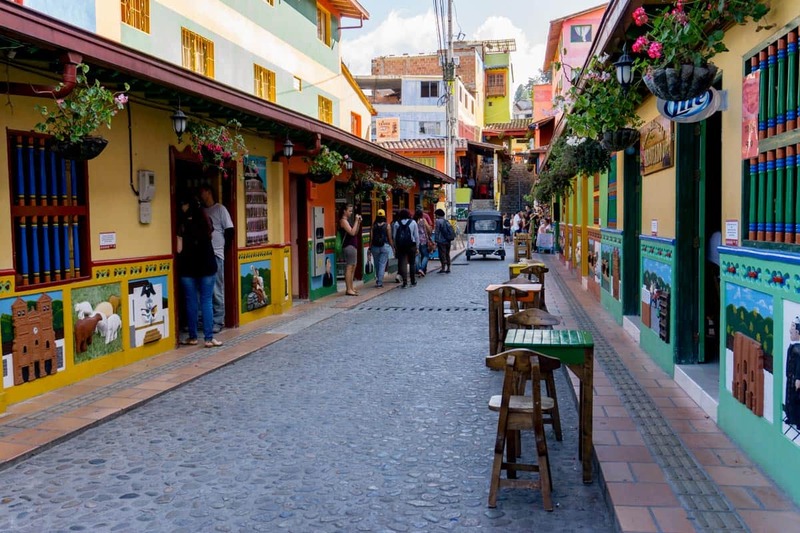 Discover the Guatape Zocalos by wandering the colorful streets. Once you leave Medellin, the view transforms from high green mountains to hundreds of lakes sprawling around the verdant rolling hills. 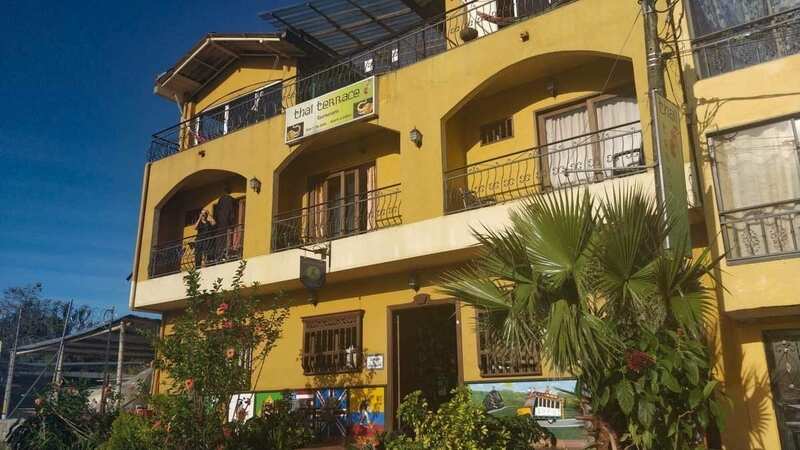 Nestled around the lake is the lively town of Guatape where every home is carefully painted with themed- placard lower borders called Zocalos. Each house and business has a theme to their zocalo – some themes are about what they do (like the hardware store, or the milk farmer). Others showcase the family dog of the home, or odes to Pink Panther, Minnie Mouse, or a tribute to the famous Colombian artist Fernando Botero. Maybe you will see Peace doves or renditions of the La Piedra del Peñol. If you like to wander, you can spend hours discovering the zocalos and checking out the colors and works of art through the cobblestone streets through the town. I admire Guatapeans for creating a name for their town through creativity. 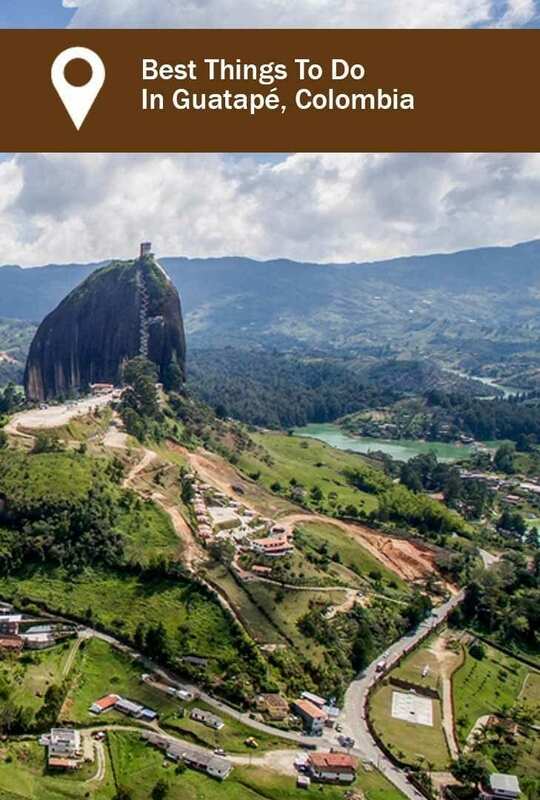 Back during the more difficult times in the 80's and 90's, this area was not safe for tourism at all, and this town invented an industry for themselves with help from travelers stopping nearby to see the big rock (el peñol guatape). The Plazoleta de los Zocalos - shop, dine, sip coffee here. 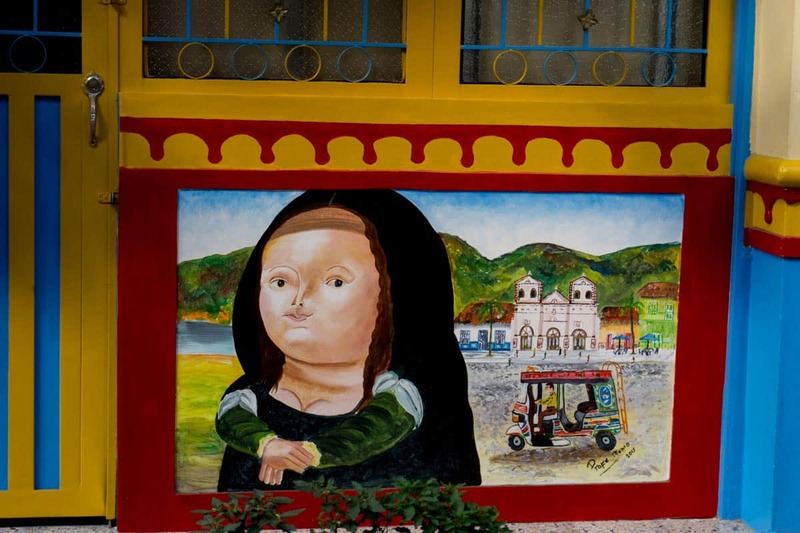 One of the many interesting themed Zocalos this one a tribute to Fernando Botero and Mona Lisa - very original! Click on the video below to see more of this amazing wonder. Of course, who doesn’t want to see the most spectacular views of mountains, lakes, and countryside? La Piedra del Peñol is a strange attraction in itself. This rock is an enormous granite structure towering 200 meters high beside the lake. The 740-step brick staircase takes you to the top where you can discover magnificent views of the area and hang up there for several hours of daydreaming time to view all the quaint lakeside homes from above. If you are parched or hungry after all those steps, no worries, you can get your fix of fresh cut fruits, juices, icecream or beer at the top. 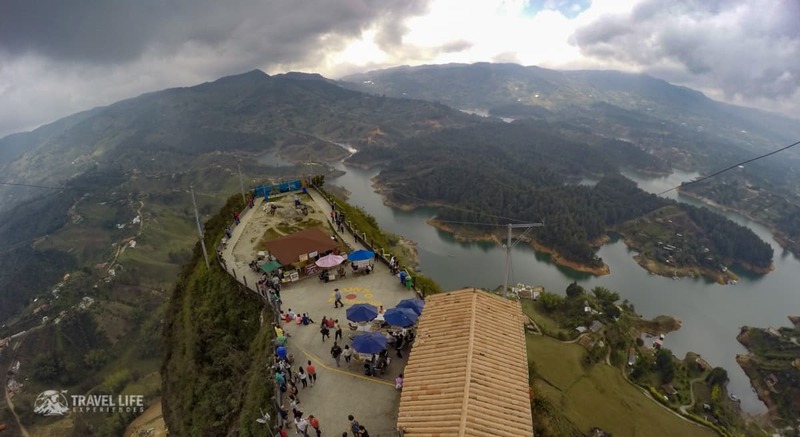 There is an entrance fee to climb and it costs 18,000 Colombian pesos (or $6.60 USD). 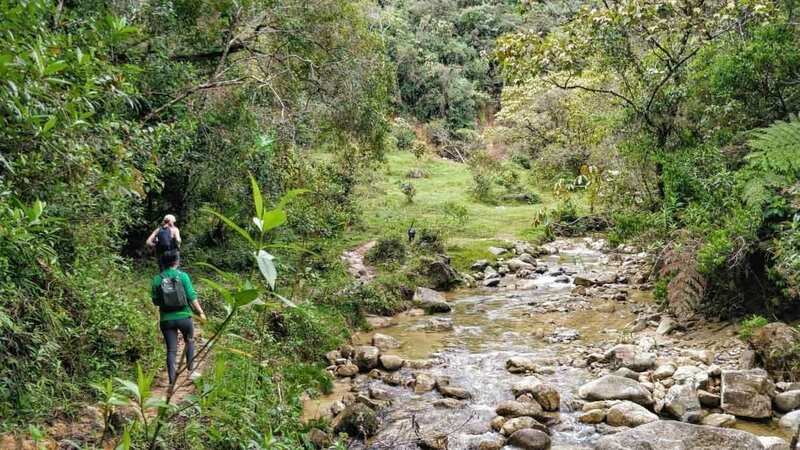 There is a rather exciting rivalry between the two towns of El Peñol and Guatapé for territorial rights and ownership of the rock. 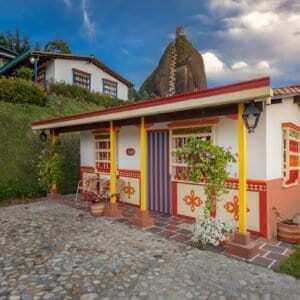 Who wouldn't want to claim ownership to one of the most prominent tourist spots in Antioquia? Which is why there is such confusion over which name to use. La Piedra or La peñon is a rock in Spanish, but you will often see it called The rock of Guatape, el peñón de guatapé or el Peñol Guatape, or la Piedra de Peñol. Heck some call it the Guatape mountain. If you stick with calling it just the rock in Spanish - La Piedra or el peñon, then you won’t offend anyone from either town. 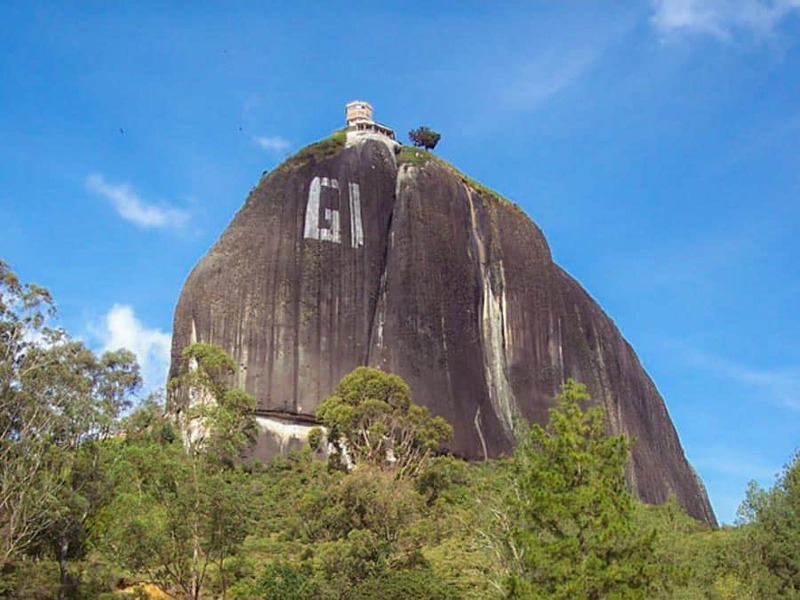 This rivalry led to Guatape staking claim to El Peñon and going to extremes by painting their town name on the rock. Which is why you see a "G- I" painted which is an incomplete "U," since the town of El Peñol found out about this project and it was ceased and never completed. Even better- see the town by renting a bike, take in jaw-dropping views of the rock by following the ring road around town, or take in a more extended bike tour with a guide for a full or half day or a combo trip = bike-hiking-waterfall tour. 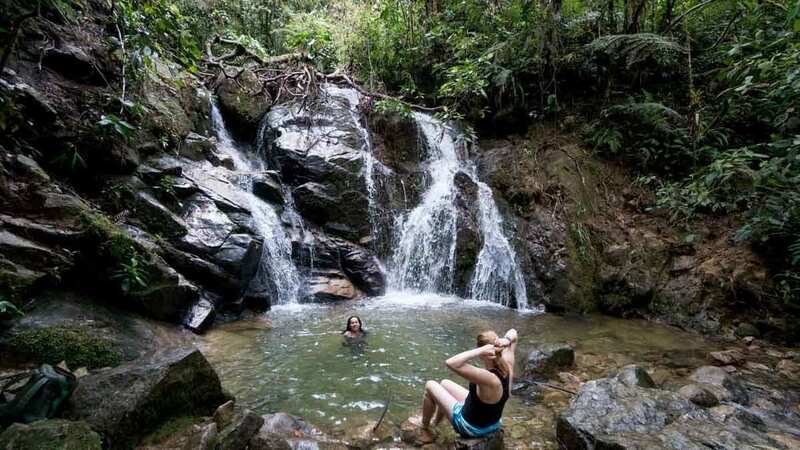 We recommend you Tour Guatape for all these adventures with the guys at Colombia Getaway. They can organize hiking, biking, paragliding, boat tours, you name it. These guys are friendly, professional using great equipment and not to worry they have an English speaking staff. You can find them right on the main street across from the Malecon (the Riverwalk) at calle 32 #25-45 or book their tours at the Lakeview hostel. Just one of the many great views biking around the Guatape Lake surrounding the town and La Piedra. And if hiking and biking are not enough for you, you can enjoy more awesome water and air activities. We plan to come back and do these kinds of tours, and we've heard nothing but great things about these activities. The team at Colombia Getaway can hook you up with all these options as well as boat tours around lake Guatape. (its actually a reservoir- but it created the lovely lakes we now enjoy). There used to be a Guatape zipline, but that business is out of service since the extensive work on the malecon (board walk) along the town. It wasn't a good business anyway so its not on our recommend list for those that ask us about it! Guatape has a step above all other small towns we've been in Colombia for finding good quality souvenirs, artifacts and artisanal jewelry and home décor. You can see the best stores on the most colorful street near the center of town – called the Plazoleta de los zocalos - you won’t miss finding it, as it clearly has the most number of colors in town. I still dream about the ice cream in Guatape. Two years later I returned, and still this is the only place I can find it. 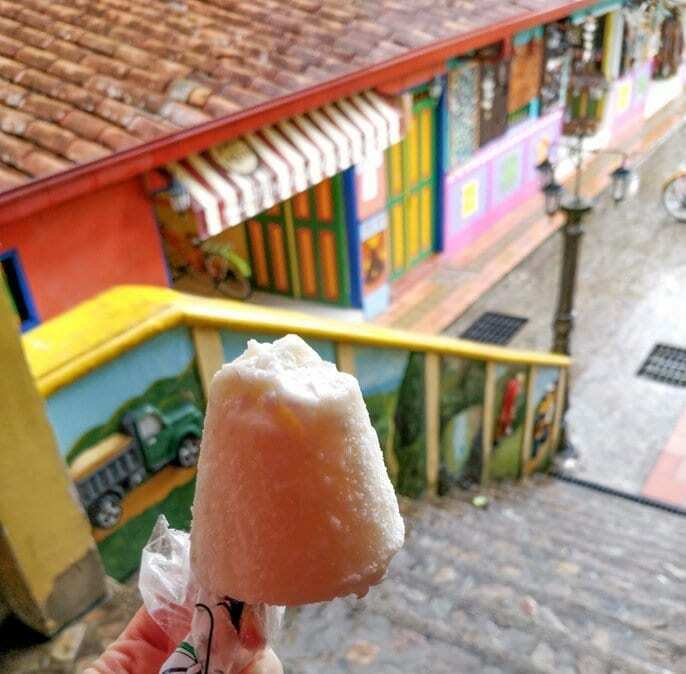 The helados of Antioquia are fantastic artisanal ice cream popsicles, in all the favorite Colombia flavors like Coco (coconut) with fresh shavings, Queso Arequipa (cheese-caramel flavor), Maracuyá (passion fruit), chocolate peanut butter and many more. Seriously, it is so good and if anyone finds this incream somewhere other than Guatape, please let us know! The Helados of Antioquia - Coconut Icecream - It's better than it looks! During our first visit 2 years ago, we found only typical Colombian food and over-brewed tinto coffee. Now, there are all kinds of international cuisines, vegetarian options and excellent espresso style cafes. Not sure where to eat in Guatape? We have some ideas for you. 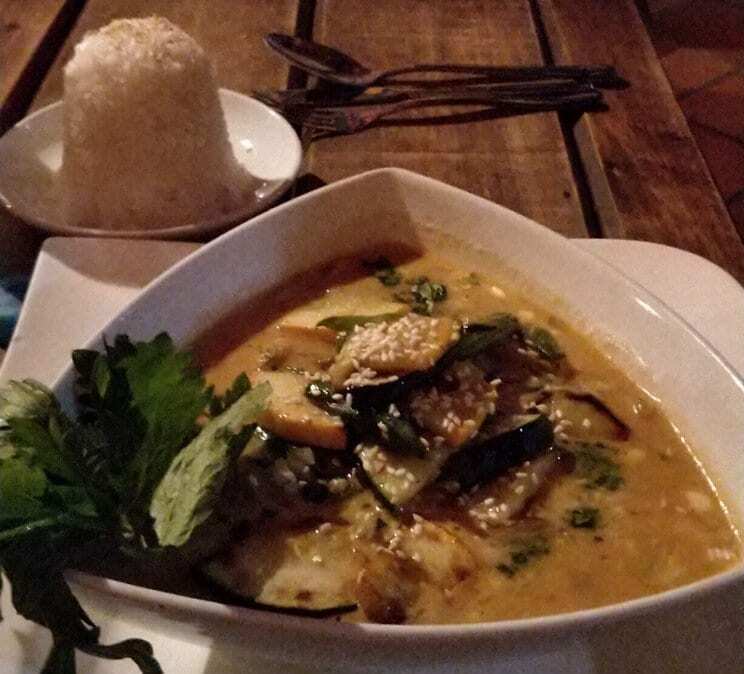 Thai Terrace ––YES! Thai food is available outside a big city in Colombia! Outstanding Thai food,located on the top floor of the Lakeview Hostel in a casual and fun setting (pictured above). We loved it so much we ate there every night. Our favorites were the Pad Thai, Red Curry, and the Malaysian Pork Masala. Get there for happy hour at 5:30pm and stay for dinner. It’s a great gathering place to meet all kinds of travelers and swap travel stories. It Open for dinner. Café La Vina -Two locations run by parents and son and wife – These guys know their coffee and can guide you to find your ideal choice and serve great juices too. 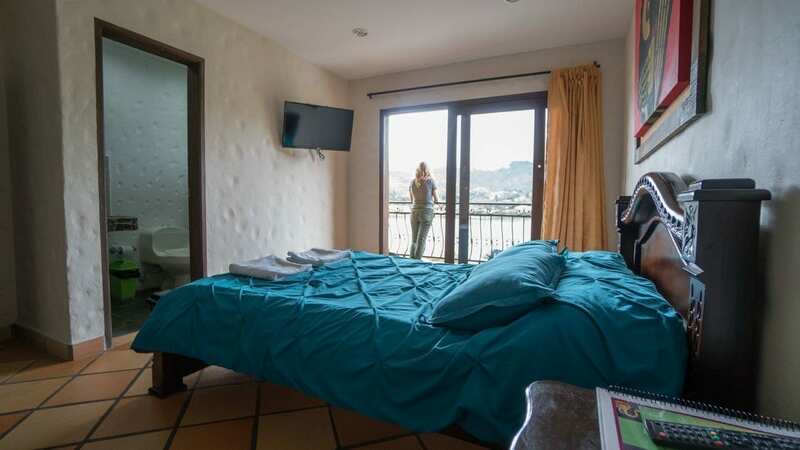 One location is near the Malecon - the lake front (located on Google maps), and the other is at the top of the stairs on the Plazoleta de los zocalos. 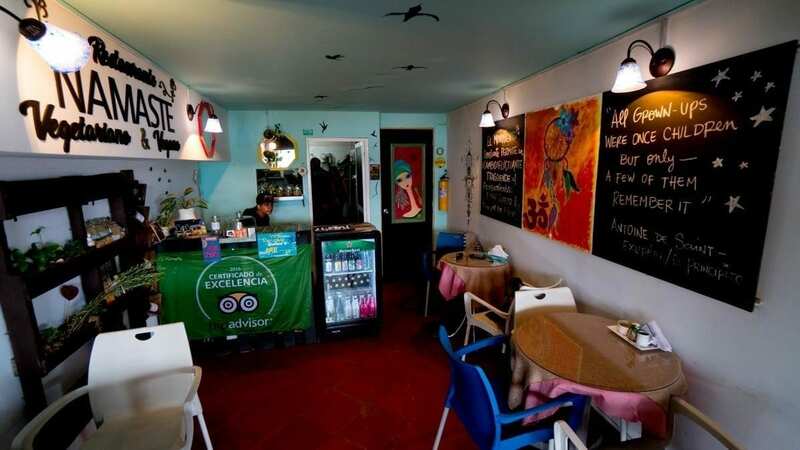 Namaste – Great quality vegetarian and vegan option located off the Malecon. Great sandwiches, pizzas. Check them out on TripAdvisor, and you'll know why they get good ratings. 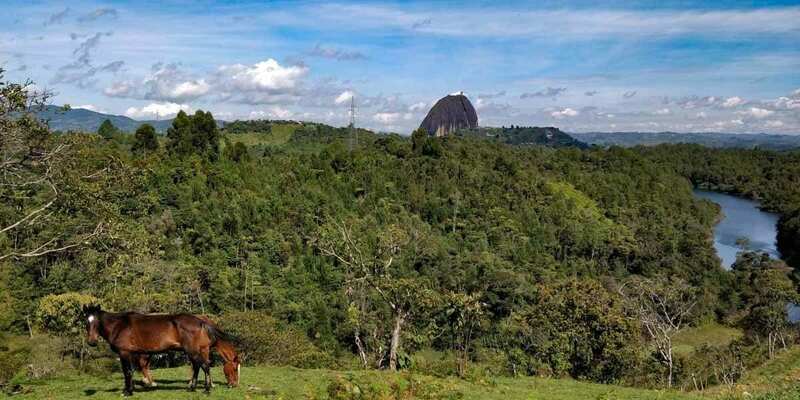 There are some great option in Guatape, here are some of our favorites. Lakeview hostel Great service and comfort. As soon as we walked through the door the staff had us fully briefed on activities, meal times, bus schedules, you name it. We booked the private room at Lakeview hostel. The rooms are super clean, comfortable with outstanding views and hot showers. There are also dorm rooms available for singles or larger groups. The breakfast is exceptional and well priced. (try the chefs omelet or the burrito) and you can take in the view too. Check out the latest prices and details. Hotel Zocalo Campestre- Do you want to stay right beside the big rock? These little cabanas are super cool and cozy with breakfast included in the room rate too. Check here for room rates and availability. A lot of travelers are intrigued by the Pablo Escobar era, and there are tours here available to see his mansion. This option that is up to you. We prefer not to visit or promote these kinds of trips as it is not our thing. Colombians do want you to experience other things about their beautiful country besides remnants of the haunting and challenging past. This is something to keep in mind to be sensitive to their point of view. If you aren't for crowds come during the week, weekends are jam-packed with Colombian families and foreign tourists, and buses fill quickly. Also, say hello and talk to the locals – they are warm and friendly and appreciate anyone who practices their Spanish and visits their town. If you have the time, stay at least a night. Take your time and enjoy being out of the big city of Medellin. A day trip is possible but you will need to pack in a big day. It's best to book a tour from Medellin in this case so you'll have the day organized to do more. Our friends took this day trip from Medellin with Get your guide and loved it. It will save you time and effort and you will see alot. The bonus about being close to the city of eternal spring is that the temperature here is usually warm. Although you will likely experiences some clouds in the afternoons so climbing up the rock in the morning is generally recommended. This area usually encounters strong rain showers, but they last for a short period of time. Expect to have some rain in March, April, May, June, July, August, September, October, and November. Expect big crowds in December until January 15th with Colombia Christmas holidays. Staying here overnight and on weekdays is always best. The town is very easy to reach on your own, and you don’t require a tour to get there. 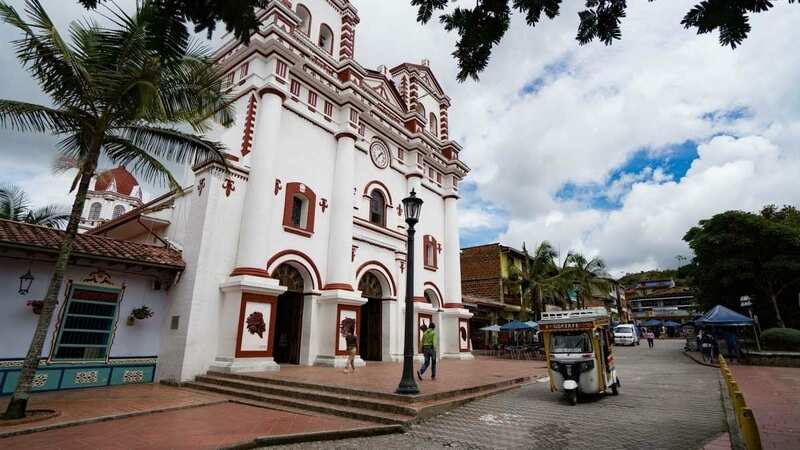 From Medellín to Guatape, take the metro to the north of the city at Caribe station and walk to the connecting North Bus terminal. On the main floor of the station, buy your ticket from any window that advertises Guatapé, El Peñol or La Piedra. – At Gate 16. A one-way ticket costs 14,000 COP ($4.85 USD) at the time of our booking; all bus companies are competitively priced. Sit back and relax in a very comfortable bus for an enjoyable and scenic tour once you get out of the city. Fantastic views and green, green mountainous landscapes. You can take a Tuk tuk easily from the Rock to the Town of Guatape with ease so the bus can either drop you off there first, or into town. Do you have more tips for Guatape- things to do, where to eat and stay that we missed? We would love to hear from you. Planning your trip to Colombia? Find out more about our Colombia posts for planning your visit here. This page includes affiliate links. By using some of the links on this page (at no extra cost to you) it will generate a small commission from any sales. This helps us keep providing quality content and tips for you. Thanks for your support. We received a complimentary stay with Lakeview hostel however we only provide honest reviews and these views are our own.